When summer rolls around, with its warm breezes and late sunsets, it’s hard to stay inside. Creating functional outdoor living spaces is a wonderful way to enjoy the fresh air and lush greenery. Decking is the foundation for any outdoor space, but with so many options out there it can be hard to know which material to choose. Andy Jozefowicz of Williams Lumber & Home Centers helps us navigate the pros and cost of different decking options. 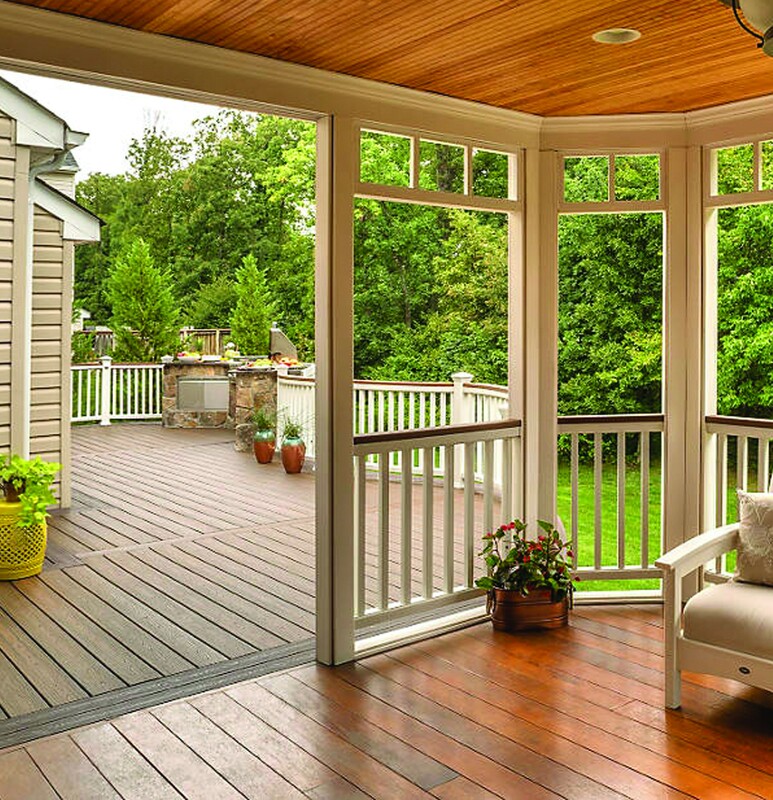 Thirty years ago treated lumber was the most popular choice for decking, and it remains the most affordable decking option. The trade-off for your up-front savings is the time (and money) spent on annual maintenance like staining and waterproofing. Thankfully, arsenic-treated wood is a thing of the past, but that also means pressure-treated decks don’t last as long as they used to. Cedar, with its beautiful amber color and natural rot- and pest-resistance, is a slightly more expensive “upgrade” for individuals who don’t want the chemicals in treated lumber. But because of the lack of preservatives, cedar decking also needs regular maintenance. One thing to note is that cedar has begun to increase in price over the past few years as western wildfires have decimated a lot of the domestic cedar production. Most cedar is now sourced out of Canada, with tariffs driving the price up closer to composite decking. 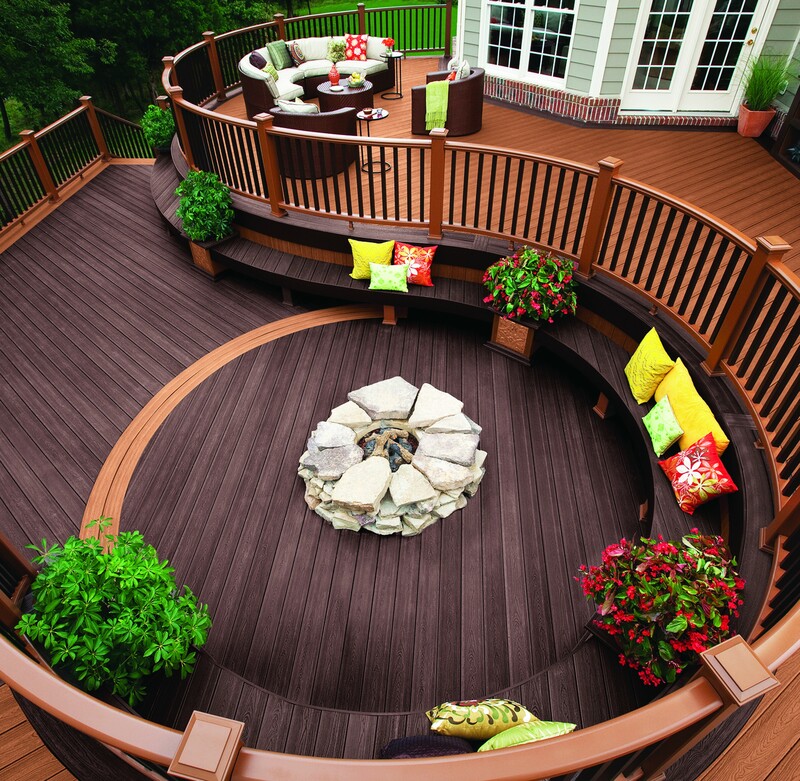 Composite decking has exploded in popularity since its introduction in the ’90s. While more expensive than treated lumber, this practical option is consistently low-maintenance, scratch-, mold-, and fade-resistant. Made from pressed wood (wood chips, sawdust, wood fiber) and plastic, some brands are made using recycled material while others use new plastic. There are many different manufacturers offering a wide array of colors, styles, and textures to create any look you want. One manufacturer (Newtech Ultrashield) offers a two-sided board, with one side featuring a straight grain pattern and the other featuring a more traditional uneven wood grain look, complete with swirls and knots. 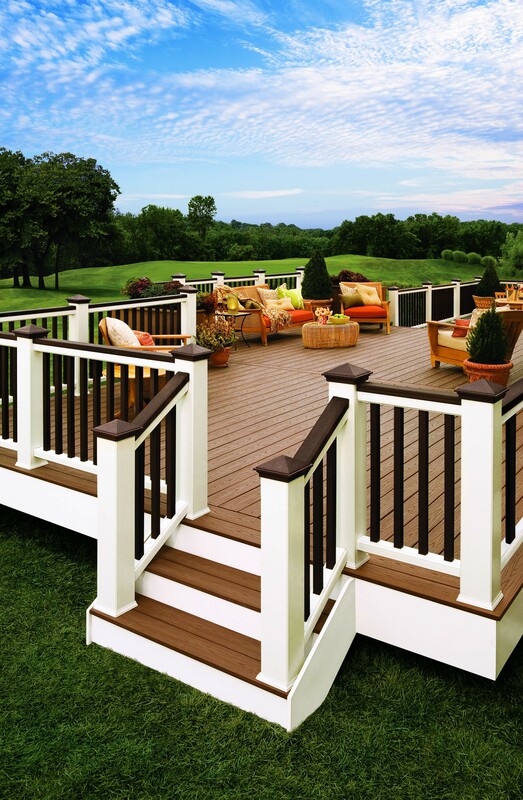 Composite decking also offers many options for assembly from hidden fasteners to special color matched screws to concealed countersunk screws and plugs. While people choose to simply “hose down the deck in April,” there are cleaners specifically designed to keep your composite looking fresh. For many, the long term-low maintenance benefits make the upfront expense worthwhile. With their rich colors and elegant patina, tropical hardwoods add character to any setting. Though this is the most expensive decking option, exotic hardwood is rot-, moisture-, and pest-resistant and requires less maintenance than either cedar or treated lumber. The most popular these days is Ipe (pronounced e-pay), which gains a beautiful silver patina as it ages. Mahogany and Garapa (a variety of ash from Brazil) are also popular options. While hardwoods require regular maintenance, it generally isn’t as involved as maintaining treated or cedar decking. In most cases, a coat of rosewood oil or a hardwood specific stain can be applied. Exotic hardwoods are more durable than treated and cedar (which is particularly soft), and are often available both grooved and non-grooved. Because of their density, they often have to be pre-drilled before being fastened, adding to the cost of construction. Kiln-dried hardwoods are a better route than air-dried as there will be less residual moisture making the boards easier to work with and less likely to warp.